Texas sued in hopes of getting access to more water from the Rio Grande river. 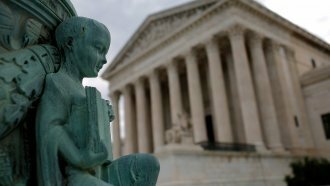 The Supreme Court will hear its first oral arguments of 2018 on Monday. The case is a yearslong water dispute between Texas, Colorado and New Mexico over the Rio Grande. The river passes through each state, starting in Colorado. All three utilize it as a source of water. In 2013, Texas took its legal battle against the two other states to the Supreme Court for access to more water. Areas like El Paso, Texas, rely on the river for more than half their total water needs. Texas is seeking to stop New Mexico from pumping groundwater to allow more H2O to flow south. Also on Monday, the high court will hear arguments in another interstate water case, this one between Georgia and Florida.